Over the past few years, the stompbox market has been inundated with boutique manufacturers competing against the major manufacturers for the consumer buck. These boutique manufacturers have not only recreated long sought after vintage pedals such as the Tycobrahie Octavia, Univibe, Foxx Tone Machine and the Sola Sound Tone Bender but have also added modern twists and updates to these classic effects. The popularity of these boutique pedals can be seen in the racks and pedalboards of the rich and famous. G2D have now joined in the fray with the release of their overdrive pedal the Custom Overdrive. This is the brainchild of Grant Wills and Dave Manning who have sought to create a versatile overdrive pedal for discerning guitar players. According to Grant, "I developed the idea for a 2 stage pedal as I wasn't satisfied with most single stage pedals commercially available. I would have had to run two pedals together to achieve the right amount of gain but I would have had to sacrifice some of the tone. I wanted to get enough gain which is not flabby when cranked and yet retain note definition and tone." Thus in July 1999, a prototype of the Custom Overdrive designed and built. The Custom Overdrive was roadtested and tweaked during this time with the emphasis on sound enhancement and the preservation of the guitar tone. The comments of the testers were taken into account and accordingly the pedal was improved upon. It was only when they were happy with the result and satisfied that they managed to squeeze every ounce of tone out of the Custom Overdrive that they decided to go into production of the pedal. As with most boutique pedal manufacturers, each pedal is handbuilt. They have incorporated features that they felt to be necessary to achieve superior tone. The response they have had from retailers have been encouraging and that the entire first shipment has been pre-sold. The pedal itself is housed in a sturdy metal casing which is compact considering that the pedal sports four knobs, two footswitches and three LEDs. The test pedal was painted in an attractive dark blue. Upon opening the pedal, the soldering looks good and the wiring neat. There are four controls for volume, tone, boost and drive. The left footswitch controls the bypass which is in fact the on/off switch and a green LED indicates whether the unit is engaged. The right footswitch selects the mode or stages and you can switch between the blues and solo modes. The LED's indicate which mode you have selected with the blue LED for the blues mode and the red LED for the solo mode. To test the pedal, my 62 Strat and Vox AC15 was used. The first thing that was noticeable was the lack of tone degradation when the pedal was plugged in. This is due to the fact that Double Pole Double Throw (DPDT) switches are used which allows the pedal to be wired in true bypass. True bypass is a hip innovation in that the guitar signal does not go through the circuitry of the pedal when the pedal is switched off. So if you are daisy-chaining pedals, you can suffer signal loss by the time your signal hits the front-end of your amp. True bypass alleviates this by ensuring that your signal follows the path of least resistance. Upon engaging the pedal, the noise level was noticeably low. The blues channel was engaged and with the drive level set to low and the volume high, you can get a good clean boost which is suitable for bringing an already overdriven amp over the edge. The tone control would have to be adjusted to suit the amplifier you are using. Increasing the drive increases the gain from a bluesy SRV type grind to a chuncky grind suitable for heavy rhythm playing or soloing. Harmonics seem to jump out of the guitar and shredders would love the ease in which tapping and sweep picking with this much gain. The beauty of this unit is not only in the amount of gain that the unit offers but the fact that note definition is retained. On most distortion units, if you use a high gain setting, it is almost impossible to distinguish between the neck and the bridge pickups. The Custom Overdrive excels here. You can clearly hear the nuances of each pickup despite the gain level that is used. Most Strat players appreciate the dynamic range that single coil pick ups offer and the Custom Overdrive retains that flavour. The tones generated is transparent and accentuates your guitar's natural tone as well as your picking style. Pick attack is retained and you do not lose dynamics through the unit. 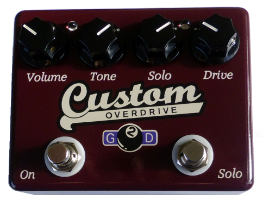 The Custom Overdrive comes in on its own when the solo mode is engaged. Not only is there an increase in gain but also there is a discernable volume boost. The level is adjusted by tweaking on the boost knob. This is best described as creamy, rich soloing tone. There is amazing sustain and definition in the notes. When used together with my old Vox Wah with Fasel inductors, the sound was expressive and the nuances of picking softly or hard, nearer the bridge or towards the neck was not lost. As a two-stage distortion unit, the Custom Overdrive comes handy in turning a single channel amp into a three-channel monster. Even when used on budget gear, the unit sound impressive. It represents good value when you consider that you would have to get two separate units to achieve what the unit can do. When compared to other boutique pedals such as the Fulltone Fulldrive II and the Prescription Electronics Experience pedal, the Custom Overdrive stands up to the challenge.